Fluffy, soft wool makes this pillow plush and comfortable. But it’s also a natural material with many health benefits—it’s hypoallergenic, anti-microbial, breathable, and temperature regulating to keep you comfy in bed year-round. Adjust the pillow’s firmness by removing wool puffs from the all-natural, quilted cotton pillowcase until it feels just right. Dimensions: Standard: 20" x 26"; Queen: 20" x 30"; King: 36" x 20"
Weight: Standard: 4 lbs. ; Queen: 4.5 lbs. ; King: 6 lbs. This is not too thick but has plenty of support. The wool pillows are the best I have ever slept on. They are warm and cozy without being hot. The worst part is having to get up! They make for a very peaceful, happy sleep. Sleep & Beyond’s all-natural, washable wool and cotton bedding is soft, comfortable, and good for your body, too. Brothers Sarvar Abdullaev and Sardor Azimovich are from the Kyrgyz Republic, where wool bedding is common, and they want everyone to benefit from this everyday luxury. Unlike most synthetic fibers, wool is breathable, wicks moisture, and helps regulate body temperature, hopefully resulting in better sleep. It can be used year-round, keeping you warm in winter and cool in summer. Plus, this hypoallergenic bedding is anti-microbial. This bedding is as easy to care for as it is luxe. Toss it straight into the washing machine, because the wool has been bio-washed—a sustainable process that removes the natural scales from the wool fiber with fewer harsh chemicals than typically used. This means that it won’t felt when you wash it, so it holds its shape, staying fluffy and bouncy. 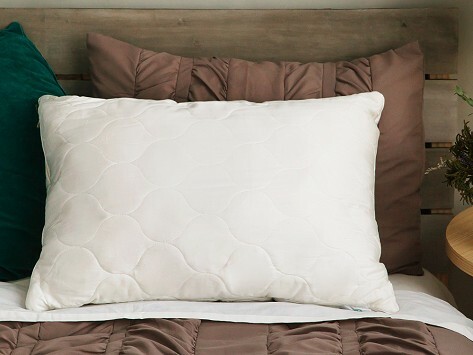 Sleep & Beyond's plush wool bedding is an investment in an all-natural, good night's sleep.